This article is about the gold five-pound coin issued periodically between 1826 and 1990. For the post-1990 cupro-nickel commemorative coin, see Five pounds (British decimal coin). For other denominations, see British coinage. The five guineas gold coin started out life as a five-pound coin before the fluctuating value of the guinea eventually settled at twenty-one shillings; therefore it is arguable that the five pounds piece issued after the Great Recoinage of 1816 is merely a continuation of the earlier value. However, the £5 coin tends to have a more modern 'feel' and so is normally considered separately. The coin was normally issued in cased "proof" condition, and rarely circulated, as well as being issued in small quantities which today often result in extremely high values of many tens of thousands of pounds being achieved when a coin appears at auction. The normal weight of the denomination was 40 grams. The first appearance of the denomination was in the reign of George III, when it was produced in 1820 as a pattern. The obverse shows the right-facing bust of the king with the legend GEORGIUS III D. G. BRITANNIAR. REX F.D. date, while the reverse shows Benedetto Pistrucci's now famous St. George and dragon design with no legend. The edge is inscribed on the normal version, but plain on the proof version. The next appearance of the denomination was in the reign of George IV, when it was produced in 1826 and 1829. The obverse shows the left-facing bust of the king with the legend GEORGIUS IV DEI GRATIA date, while the reverse shows a crowned shield within a mantle cape with the legend BRITANNIARUM REX FID DEF. The 1826 coin has the edge inscription DECUS ET TUTAMEN ANNO REGNI SEPTIMO, while the 1829 coin has a plain edge. The next coin of this value did not appear until early in the reign of Queen Victoria, when one of the most famous and attractive of all British coins was produced, colloquially known as the Una and the Lion coin. Una and the Lion are characters in Spenser's The Faerie Queene, this five pounds piece has acquired a cult significance among collectors: the obverse shows the young head of the Queen, facing left with the legend VICTORIA D G BRITANNIARUM REGINA F D, while the reverse shows Queen Victoria as Una leading the lion to the left, with the legend DIRIGE DEUS GRESSUS MEOS – May the Lord direct my steps (some coins say DIRIGIT instead of DIRIGE – The Lord directs my steps) – with the date MDCCCXXXIX in the exergue under the lion. The edge may either have the inscription DECUS ET TUTAMEN ANNO REGNI TERTIO or be plain. This issue is the lightest of all the £5 coins, weighing only 38.7–39.3 grams. The next appearance of the denomination was not until 1887, when the Jubilee head was used with the obverse inscription VICTORIA D G BRIT REG F D, while the reverse shows Pistrucci's design of Saint George slaying the dragon, with the only legend being the date in the exergue. The edge of this coin is milled, and it weighs 40 grams. This coin was also (rarely) produced in the mint at Sydney, Australia, which is identified by the letter "S" above the centre of the date. The Pistrucci reverse was used again in 1893, when the obverse used the "Old Head" or "Veil Head" of the queen, with the legend VICTORIA DEI GRA BRITT REGINA FID DEF IND IMP, and the edge is again milled. In the reigns of Kings Edward VII, George V, (Edward VIII), and George VI, five pound coins were only issued in proof sets in the first year of their reign (only prepared for approval in the case of Edward VIII, which is why his coin is valued at around £175,000!). All these reigns used the Pistrucci George and Dragon obverse, with the 1902 and 1911 coins having milled edges, though at least some of the 1937 coins have plain edges. The 1902 Edward VII coin was also minted at Sydney, being identified by an "S" above the centre of the date. The reign of Queen Elizabeth II saw a departure from the normal practice in issuing gold coinage. A small number of gold £5 pieces were struck in 1953 in order to provide continuity of the series, and again in 1957, but neither of these strikings were released to the public, with the result that they are now valued in the £250,000–£500,000 range. No further £5 gold pieces were struck until 1980, nine years after decimalisation, since when they have been issued somewhat haphazardly in most years. Coins from 1980 to 1984 use the Arnold Machin effigy of the Queen, while the 1985–1990 coins use the Raphael Maklouf effigy. All these years use the Pistrucci reverse. In 1989 a completely new design was used to commemorate the 500th anniversary of the first issue of the sovereign coin – the obverse shows the Queen seated on the coronation throne holding the orb and sceptre, with the legend ELIZABETH II DEI GRA REG FID DEF, while the reverse shows a crowned shield within a double rose and the legend ANNIVERSARY OF THE GOLD SOVEREIGN 1489–1989. 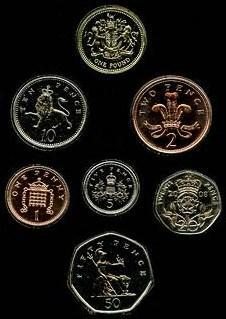 The £5 coins (non commemorative) are 36.02 mm in diameter in contrast to the commemorative 'crowns' that are 38.6mm diam. Since 1990 £5 coins have been produced in cupronickel, but premium versions in silver and gold are often produced. These have been issued alongside new issues of the traditional Pistrucci-reverse five-pound gold coin, which have been produced in limited numbers in each year except 2002, when a special commemorative for the Golden Jubilee revived the shield reverse. These "modern five pound coins" are a continuation of the crown which was issued from 1544 as a five shilling coin. The modern five-pound issues are not issued for circulation, but to mark events or commemorations of national or Royal significance. What is nowadays known as the Two Guineas coin was first minted in 1664, in England, when it had a nominal value of forty shillings and it was known as a forty-shilling piece, then it was later called a double-guinea or two guinea piece, worth forty-two shillings after the Proclamation of 1717 finally settled the value of a guinea. The term "guinea" indicates the source of the gold used to strike the coin, i.e. from west Africa. For most of its period of production the coin weighed 16.7 - 16.8 grams and was 31-32 millimetres in diameter, although the coins of Charles II were about 0.1 grams lighter and 1 millimetre smaller. The guinea was a coin of approximately one quarter ounce of gold that was minted in Great Britain between 1663 and 1814. The name came from the Guinea region in West Africa, where much of the gold used to make the coins originated. It was the first English machine-struck gold coin, originally worth one pound sterling, equal to twenty shillings, but rises in the price of gold relative to silver caused the value of the guinea to increase, at times to as high as thirty shillings. From 1717 to 1816, its value was officially fixed at twenty-one shillings. A seven shilling piece was introduced in Great Britain by a proclamation of 29 November 1797. It has been called a third guinea, a guinea being worth 21 shillings. The gold coin was minted only in the reign of George III. The sovereign is a gold coin of the United Kingdom, with a nominal value of one pound sterling. Struck from 1817 until the present time, it was originally a circulating coin accepted in Britain and elsewhere in the world; it is now a bullion coin and is sometimes mounted in jewellery. In most recent years, it has borne the well-known design of Saint George and the Dragon on the reverse—the initials of the designer, Benedetto Pistrucci, may be seen to the right of the date.